Hither is the culinary vision of Corrie and Wesley Reimer. With over a decade of combined experience in New York, Portland, and San Francisco, the couple brings an abundance of talent, knowledge of quality food and wine, and connections with the best farms and purveyors. 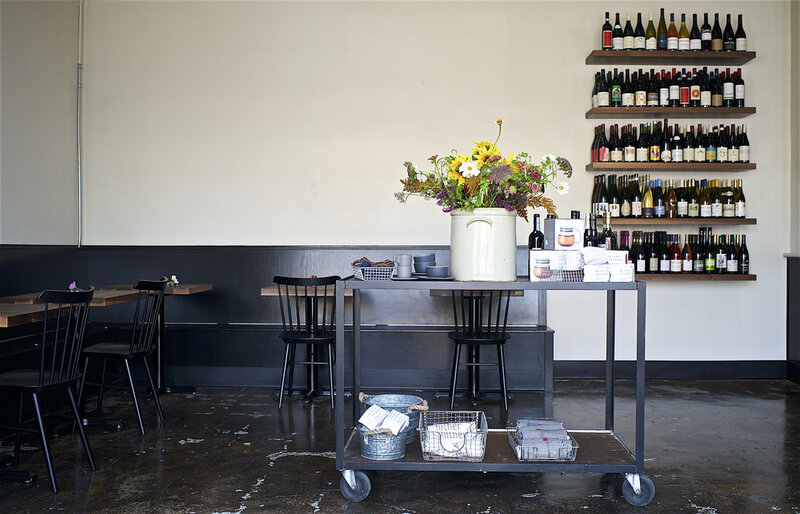 Hither is the Rogue Valley's only shop specializing in natural and biodynamic wine. A natural wine is one that goes through fermentation by way of native yeasts without any other additives or manipulation. The intention is to make a wine that captures the weather, varietals, and vintage. Sightglass is an independent, sibling-owned coffee company in San Francisco. The food at Hither is honest and simple, yet with attention to detail. We make everything in-house, including bread, crème fraiche, and yogurt. Hither marries traditions from the old world, with the food culture of Oregon. We aim to demonstrate our love for the local and regional food with our daily breakfast and lunch offerings. We purchase produce from local farmers as much as possible. Sightglass Coffee , Leaves and Flowers, Happy Dirt, Wandering Roots, Fry Family Farms, Two x Sea, Provista, Health Ceramics, NPG Napkins, Provvista, Freddy Guys Hazelnuts, and many more stellar companies. 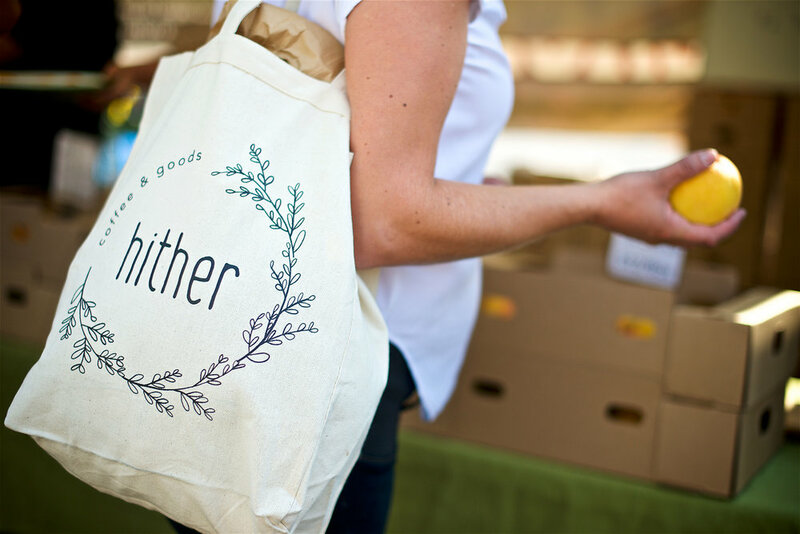 Hither has a little bit of everything; Sightglass Coffee, Leaves and Flowers tea, housemade cakes, fresh baked goods, carefully soured cheese, soups, and made to order sandwiches. It’s not just a store for shopping, it’s a place in the neighborhood where people can pop in for a chat or just browse around. A real part of the community. Corrie Robinson-­Reimer got her start with Danny Meyer's renown Union Square Hospitality Group in New York City, where she quickly developed a love for the industry. She took to heart USHG's belief that hospitality is the work of improving lives, inside and outside the walls of the restaurant. This fuels Corrie's passion for her job, believing that extending her hospitality into the community strengthens our own culture and business. She then went on to manage The Woodsman Tavern in Portland, Oregon. This is where Corrie found her love of natural wine and the ethics it instills, that of honesty and distinct practices that involve its production. From there Corrie accepted a position as General Manager of Melissa Perello's restaurant, Frances in San Francisco. Frances helped develop Corrie's vision for a place surrounded by locally sourced food, honest wine, and a warm environment. Corrie's career has pointed her towards Hither, every step has made her vision for Hither more unique and curated. Wesley Reimer went to culinary school in New York City at the International Culinary Center. After graduating with top honors, Wesley took a job in Portland, Oregon at Roman Candle Baking Company, where he found his love for the bakery. Blending the classic French techniques with the abundance of Oregon produce, Wesley started creating some truly special food. His hard work and tireless motivation to his craft, awarded him an offer from Melissa Perello at her new restaurant, Octavia. He worked under the talented Pastry Chef Sarah Bonar to create an extraordinary dessert program. This, as well as the work of Perello and her top notch staff, helped secure Octavia with its first Michelin Star. Wesley's experience from the kitchens of New York City, to the warmth and honest work of San Francisco pushed him toward opening Hither.